Could the next wave of locations for the local church be at the local cineplex? Many churches who are considering the multi-site alternative (one church, many locations) are discovering that the local theater makes for an excellent choice. Check out this article from two fairly close churches within an hour or so from Mansfield. While it’s not uncommon for churches to meet in secular venues such as strip malls or schools, they usually do it until they’re able to build. In the case of The Summit or RiverTree, they’re happy to use the theaters indefinitely. It’s a marriage that, although unlikely, works well for both parties, said Roger Schuler, pastor of the RiverTree Massillon Campus. Theaters like it because churches are good tenants, and their space is vacant on Sunday mornings. Churches like it because it’s a comfortable setting for only a fraction of the cost of a new building and a mortgage. I like the economics of the idea. I also like how it provides a familiar setting for the world to hear Christ's good news. I think the Apostle Paul would have approved. Though I wonder how the generation of my grandparents would feel about this development. Now fast forward 4 decades. I enjoy seeing movies at the theater, though I don't have much time to do so. And I think it would be cool to see men and women come to Christ on Sunday mornings at a local theater. Crossroads is still in the evaluation mode regarding the multi-site concept. 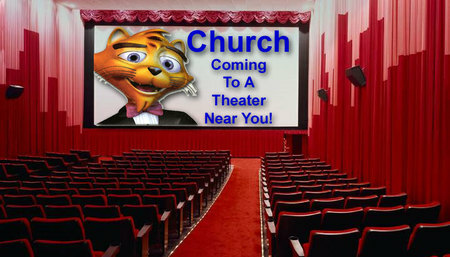 But if our church should decide eventually to become one church with many locations, it just might be possible that one of those locations could be a movie theater some day! The Hartford Institute for Religious Research released a study last week on current mega church trends. A mega church is one of 1200 Protestant churches in America with over 2,000 people in weekly attendance. The study compares results from the years 2000, 2005 and 2008. The study is quite long and detailed, so if you would really like to study the results you may wish to download the 15-page PDF file and print it out. Remain minimally involved in politics. Putting greater emphasis on the role of small groups. It is valuable to review this report in one hand and evaluate Crossroads with the other. In many ways we are experiencing the same trends. We are considering multiple locations, have a greater role in the community, and are watching our small groups expand in importance. However, unlike many other mega churches, we have not experienced the same significant growth in attendance over the last 3 years. Yesterday as I was reading the Monday Morning Insight Weblog by Todd Rhoades (also from the Buckeye state), I learned of a webinar taking place this afternoon and again next Tuesday afternoon. It is being provided by "Multi-site Exposed", the same folks putting on two conferences this fall. We are sending several people to the Multi-Site Conference in Chicago September 15/16. (There's a second conference in Mount Pleasant, SC on September 29th and 30th.) It makes so much sense for us to take advantage of this webinar offer! The webinar is free. All one has to do is sign up. The signup process is quick and painless. I've already done so. Today's session (3:00 PM - 4:00 PM CDT - that 4 PM East Coast, right?) includes speakers Dave Ferguson, Mark Jobe, Jim Downing and Darrin Patrick. There's another webinar next Tuesday featuring Greg Surratt and Mark Batterson. What a great deal this is! Anyone interested in the topic of Multi-site should take advantage of this chance. In fact, I'm going to invite some of our staff to sit in my office with me while I put the webinar up on my TV screen. Maybe we'll even pop some popcorn!